In 2010, journalist Frederick Kaufman wrote in Harper’s Magazine about how Wall Street speculators wreaked havoc with wheat markets and, in turn, helped drive the 2008-09 food price crisis. 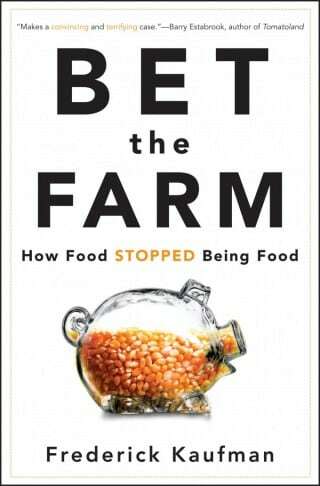 Now, he’s out with a new book titled Bet the Farm: How Food Stopped Being Food that goes into depth on how the increasing financialization of food effects farmers, consumers and global hunger. Research for the book brought Kaufman to farms, food science research labs, agribusiness giants, the United Nations and the Chicago Mercantile exchange. Bet the Farm is an accessible, sharp critique of how our food system has become increasingly captured by the big banks and giant food and agribusiness companies. Kaufman graciously accepted our invitation to answer five questions about the new book. You write about the remarkable growth of the pizza industry, not only here but around the world. How has that impacted the agricultural economy? Global pizza constitutes layers upon layers of global commodities: At the bottom lies commodity wheat, in the middle, commodity milk and cheese, and more times than not the concoction is crowned with pepperoni, a combination of commodity beef and pork. And let’s not forget the tomatoes, which are the closest we come to a commodity crop in the vegetable kingdom. So, while Domino’s and Papa John’s and Little Caesar’s and Pizza Hut advertise millions of combinations and possibilities for pizza, the underlining structure of the retail pizza business is monocultural, herbicide- and insecticide- and water-intensive agricultural methods on vast tracts of commercial land. Perhaps there is an argument to be made that when it comes to farming, bigger is better. The problem is that the commodities themselves are increasingly being priced based on the activities of international financial institutions, not the farmers, millers and bakers. Global pizza has become less of a food, and more of an investment for those with the deepest pockets, and Wall Street has led the charge. Why are efforts to set a strict definition for “sustainability” so important for the food industry and others? We all believe we know what it means. But in research for Bet the Farm I found that “sustainability” has become one of the most important marketing terms and tactics of this new century: Sustainability sells. And when I went to the University of Arkansas to interview the men and women at the Walmart-funded sustainability research center, I discovered that no one really knows how to calculate sustainability. In the case of a can of tomatoes, we actually do not possess the math to weigh the environmental impact of the can against the water against the diesel against the tomatoes in the can. But that doesn’t mean a sustainability label wouldn’t sell that can of tomatoes! From a bank’s perspective, why is food always a good investment—even, and perhaps particularly, in bad times? How does the banks’ growing involvement in commodity markets affect farmers and consumers? Since 2008, there has been a mad rush to find investment “value.” Stocks and bonds and real estate and even dollars and euros have become suspect. But the smart money knows that going forward, arable land and fresh water and basic food commodities will retain value, and even grow in value. Of course, it is great when you invest in a product and watch the line on the graph go up. Except for the fact that each uptick in the global price of food is also an uptick in the number of people who cannot afford the food, the growing number of the world’s food insecure. And, as the price of commodities becomes ever more volatile on the international exchanges, farmers are increasingly being left behind. The largest investors are the ones who can hire the PhD’s from MIT to manage their hedging operations. Meanwhile, small farmers simply have to pay more for all their inputs, from seeds and insecticides to their diesel fuel. What concerns do you have with the U.N. World Food Program’s Purchase for Progress program? Purchase for Progress (P4P) is a classic case where the richest and most developed countries on earth believe that the path for the success for the poorest and least developed nations should simply be a game of Simon Says. In other words, do what we did, because we got it right. The idea of P4P that I object to most is the blanketing of commodity markets over the nascent food markets in nations such as Tanzania and Rwanda and Uganda and Guatemala. These markets will benefit the largest plantation owners, the biggest growers and the largest millers and warehouses, not to mention the bankers who will put these markets together. Most farmers will be left behind. Commodity markets are great things, but they must grow organically from an agricultural context, and not a forced march to the future. What steps might we take to return food to being food? First step: Get Wall Street out of the global food supply. And that’s simple: Bring back the so-called “position limits,” which limit the number of futures and options contracts non-agricultural institutions can hold. That would make food less of an investment, and allow food to be what it is: In short, the most precious thing on earth. We can also ease plant patent laws, so that food can become less of a legal construct. In the United States, we can bring back the national strategic grain reserve, which we had under the Clinton Administration. These buffer stocks help blunt the peaks and valleys of food price and help farmers manage risks going forward. Finally, we need to encourage countries to stop using food as a political football, a tool of foreign policy. Every nation needs to develop its own systems of food security and support their farmers: big, medium, and small.